String one gold-filled 3mm round bead onto a 1-inch eyepin. Using a pair of chain-nose pliers, round-nose pliers and flush-cutters, form a simple loop on the straight end of the wire, creating a gold-filled 3mm round beading link. Repeat to create a total of fifty-nine gold-filled 3mm round beading links. Repeat Step 1 to create one Swarovski 3mm bicone amethyst crystal beading link using one Swarovski 3mm bicone amethyst crystal and one 1-inch eyepin. Repeat Step 1 to create one gold-filled 3mm round bead drop using one gold-filled 3mm round bead and one 1-inch headpin. Repeat Step 1 to create one gold-filled cone and amethyst crystal bead drop using one Swarovski 8mm round amethyst crystal, one gold-filled 24x9mm cone bead and one 2-inch headpin. Using a pair of flush-cutters cut twelve 1-1/2 inch lengths, ten 1-3/4 inch lengths, two 1-inch lengths, two 4-inch lengths and two 9-1/4 inch lengths of gold-filled 1.4mm cable chain. Using a pair of chain-nose pliers and flat-nose pliers, open a 4x3mm oval jumpring. Pass it through the first loop on the slide insert portion of the clasp and the first loop on a gold-filled 3mm round beading link. Close the jumpring. Open a 4x3mm oval jumpring. Pass it through the first loop on the second portion of the clasp, and the opposite loop on the last gold-filled 3mm round beading link. Close the jumpring. Open a 4x3mm oval jumpring. Pass it through the second loop on the slide insert portion of the clasp and the first loop on a gold-filled 3mm round beading link. Close the jumpring. Open a 4x3mm oval jumpring. Pass it through the second loop on the second portion of the clasp, and the opposite loop on the last gold-filled 3mm round beading link. Close the jumpring. 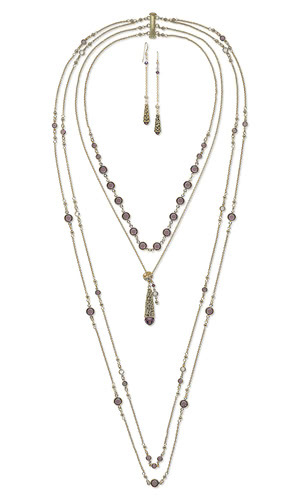 Open the loop on a gold-filled cone and amethyst crystal bead drop. Pass the loop through the bottom loop on the gold-filled 3mm round beading link between the chains from Step 7. Close the loop. Open a 4x3mm oval jumpring. Pass it through the third loop on the slide insert portion of the clasp and the first loop on a gold-filled 3mm round beading link. Close the jumpring. Open a 4x3mm oval jumpring. Pass it through the last loop on the second portion of the clasp, and the opposite loop on the last gold-filled 3mm round beading link. Close the jumpring. Open the loop on a gold-filled 3mm round beading link. Pass it through the bottom loop on the gold-filled 3mm round beading link from Step 11. Close the loop. Open the opposite loop on the last gold-filled 3mm round beading link from Step 19. Pass it through the bottom loop on the gold-filled 3mm round beading link from Step 11 on the opposite side of the necklace. Close the jumpring. String one gold-filled 3mm round bead onto a 1-inch eyepin. Using a pair of chain-nose pliers, round-nose pliers and flush-cutters, form a simple loop on the straight end of the wire, creating a gold-filled 3mm round beading link. Repeat to create a total of two gold-filled 3mm round beading links. Repeat Step 1 to create a total of two Swarovski 3mm bicone amethyst crystal beading links using one Swarovski 3mm bicone amethyst crystal and one 1-inch eyepin. Repeat Step 1 to create a total of two gold-filled cone and amethyst crystal bead drops using one Swarovski 4mm round amethyst crystal, one gold-filled 14x5mm cone bead and one 2-inch headpin. Using a pair of flush-cutters cut two 3/4 inch lengths of gold-filled 1mm rolo chain. Using one pair of chain-nose pliers and flat-nose pliers, open the loop on an earwire. Pass it through the first loop on a Swarovski 3mm bicone amethyst crystal beading link. Close the loop. Open the opposite loop on the Swarovski 3mm bicone amethyst crystal beading link. Pass it through the first link on a 3/4 inch length of chain. Close the loop. Open the loop on a gold-filled 3mm round beading link. Pass it through the last link on a 3/4 inch length of chain. Close the loop. Open the opposite loop on the gold-filled 3mm round beading link. Pass it through the loop on a gold-filled cone and amethyst crystal bead drop. Close the loop. Repeat Step 3 to create the second earring.